Flaenia Amiulusus is an Imperial drillmaster and a Journeyman for the Fighters Guild. She is located in the training room of the Guild of Fighters in Balmora, where she offers minor training in Athletics, Block, and Spear. 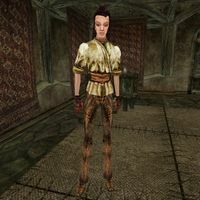 Flaenia wears a common shirt with matching gloves, belt, shoes, and pants. In combat, she relies on an iron spear. Aside from her natural charm and ability to absorb fatigue from others, Flaenia knows no spells. Flaenia is one of only two people in the entire game to offer Spear training, the only other being the master trainer, Mertis Falandas. This page was last modified on 29 June 2014, at 01:30.